The United States Congress designated the Cache La Poudre Wilderness (map) in 1980 and it now has a total of 9,482 acres. All of this wilderness is located in Colorado and is managed by the Forest Service. Nine miles of the Little South Fork of the Cache la Poudre River, a part of Colorado's only designated Wild and Scenic River drainage, flow through Cache la Poudre Wilderness. The water has cut a deep and tortured canyon into granitic bedrock, typical of the Front Range of Colorado, to join the Main Fork of the Cache la Poudre River, which forms the northern boundary of the Wilderness. Elevations range from about 6,100 to 8,700 feet, and a dry climate keeps this area snow-free for much of the year, especially on south-facing slopes. Douglas fir and ponderosa and lodgepole pine dominate the forest. Celebrated for their trout, the rivers draw the most human visitors, but lack of trail access and rugged topography make this small Wilderness one of the state's least explored areas. State Highway 14 along the Main Fork of the Cache la Poudre River sees many campers and even more fly-casting anglers. Once inside the boundary, you'll find the ground marked by only two short maintained paths. The Kreutzer Nature trail is about 2 miles. The Mount McConnel Trail, which loops off of the Kreutzer Nature Trail is about 3 miles. 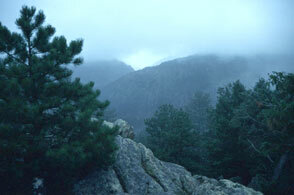 In 2012 the High Park fire burned 95% of the Cache la Poudre Wilderness. In 2013 floods have impacted the backcountry areas of this Wilderness and changed the landscape. Please be careful when traveling through this Wilderness. Planning to Visit the Cache La Poudre Wilderness? How to follow the seven standard Leave No Trace principles differs in different parts of the country (desert vs. Rocky Mountains). Click on any of the principles listed below to learn more about how they apply in the Cache La Poudre Wilderness.